My first spiritual awakening occurred on the morning of July 18, 1990. It was sudden and intense. Never before had I experienced anything like it. I had been bitterly unhappy, chronically depressed, and compulsively alcoholic for many years. But that morning, the "old me" collapsed within a matter of minutes. And within weeks, my life began to change in every way. To this day, I am convinced that I experienced divine intervention, saving me from self-destruction and setting me on a course of profound personal transformation. A decade later in the year 2000 when my father was dying of cancer, I experienced a second spiritual awakening. This one lasted several months and left me with a deep and enduring interest in near-death experiences at first and then in all things spiritual. 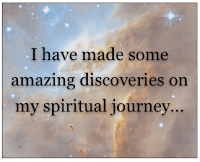 I have made some amazing discoveries on my spiritual journey in the years since these awakenings. I would like to share the most important ones with you. To begin, I have learned that this physical world is just an illusion, much like those computer-generated holograms on the starship Enterprise. Indeed, the entire physical universe is an illusion. Collectively, we created this illusion in an attempt to separate ourselves from God. But in fact, we never really left Heaven. Even now, we are there, dreaming we are having an adventure in the physical world. Having created the illusion of a physical world, we then began to create an illusion of physical bodies in order to come as separate beings and exist here. Of course, we forgot we created physicality. We forgot we are spiritual beings. We began to believe that physical “reality” is real. We began to believe we are the physical bodies we created. Since our physical bodies are not real, then physical death must also be an illusion. As spiritual beings, we cannot die. Nor can we truly be harmed in any way. We simply return to the spirit realms following the event we call death. We often refer to life after death as “the afterlife” but, in truth, we spend nearly all of our eternal existence in the spirit realms. Of course, we can come back to the physical world through the process of reincarnation whenever we choose, but our sojourns here are fleeting compared to our eternal existence in the spirit realms. Our never-ending desire to evolve spiritually is what inspired us to create physicality in the first place. We knew we could immerse ourselves in it. We knew we could thus experience challenges that would seem real and would accelerate our spiritual growth. But for this to work as we intended, it had to be convincing. Eons have passed since we first immersed ourselves in the physical illusion. At long last, it is time for us to discover that it is not real, even as we still wander around in it. We no longer need to deceive ourselves. We need instead to remember what we really are and why we really decided to come here. We need to remember that we are not really separate from Spirit nor each other and we never have been. We create all that we experience here in the physical world. As spiritual beings, our ability to create is unlimited. But even after countless incarnations, we continue to forget that we are creators when we come here. We continue to create, but we do so unconsciously. Having forgotten that we ourselves create what we experience here in the physical world, we have concluded instead that we are victims of other people and life’s circumstances. We now need to remember that the events in our lives are not happening to us. Rather, we are creating them with our thoughts and emotions and with our beliefs and expectations. Interestingly, two people can co-create an event together. They may believe they are experiencing this event in the same way. But in fact, each of them perceives and interprets it so differently that it doesn't sound like the same event when each of them later describes it. The law of attraction says we create whatever we choose to focus on. We can continue to focus on fear of war, terrorism, crimes and violence, conspiracy theories, and other forms of negativity if we so choose, but in so doing, we will attract more of that kind of negativity into our individual and collective experience. As creators, we can transform our lives and the world we live in by first changing the way we think, feel, and believe. A global shift in consciousness is now underway here on Earth. We are shifting from a low level of physical consciousness -- characterized by widespread fear, ignorance, and greed -- to a higher level of spiritual consciousness of endless love, joy, and bliss. This shift has been unfolding for some time. As often happens during a time of transition, there has been some turbulence. Most people don’t seem to know what is going on. So for them, the transition is causing a sense of fear and panic and leading them to behave in destructive ways. If they were to awaken spiritually, they would come to understand what is happening, and the shift would thus become a much gentler experience for them. When enough people have awakened spiritually, we will reach a critical mass that will spark a global awakening affecting all of humanity. This global awakening could occur slowly over time. Or it could occur as an instantaneous event. Unfortunately, extreme suffering often must precede any awakening because we are lethargic and most of humanity would rather remain asleep. We may need a crisis or even a catastrophic event -- as I did in 1990 -- to wake us up. In any case, as spirits we have come to Earth at this time to participate in the global spiritual awakening. We have come hoping to contribute to it. The global shift, or awakening, is leading us to the ascension. The ascension is a process or event which will propel us out of the 3rd dimension -- with all of its fear and ignorance -- and into a higher spiritual dimension. This is what the Biblical term "rapture" means. Our level of vibration is increasing in preparation for this to happen. As our vibration increases, time seems to be accelerating. The acceleration of time is giving us an ever-growing sense of urgency. For some time now, we have been feeling this sense of urgency, and it has been affecting us physically and emotionally. But know this: Like everything else in the physical world, time is an illusion. We invented it -- along with clocks and calendars to measure it -- as a way to separate the overwhelming crush of events in our lives. In the spirit realms, we do not feel the passage of time. Nor do we experience a sense of urgency. There, all of eternity awaits us. To conclude, the veil that seems to separate us from Spirit is becoming thinner as more and more of us recognize that we are spiritual beings cleverly disguised in physical bodies. We are now discovering that we created the physical world as a place in which to accelerate our spiritual growth through the experiences we have here. We are now beginning to understand that a global shift in consciousness is occurring that will lead us to the ascension. Soon we will no longer want or need to maintain the veil that separates us from Spirit. In fact, I have come to define spirituality as everything we do -- in our spiritual studies and spiritual practices -- to end the erroneous belief that we are separate from Spirit. Through the spiritual discoveries we have been making, our experience here on Earth will never again be the same. I am eternally grateful for my own spiritual awakenings in 1990 and 2000. I am especially grateful for the way in which those awakenings have led me to the important spiritual discoveries that have so profoundly affected my life. Yes to all of the above Roy!! That's exactly how I feel too. What a great time to be here, and to experience all the changes and challenges this time is presenting to us, all for the best of course.